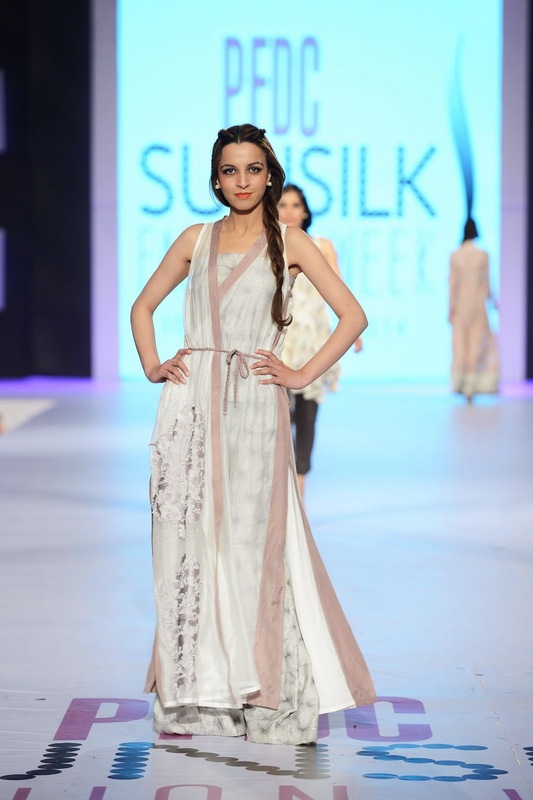 [Lahore: 13th April 2014] The Pakistan Fashion Design Council in collaboration with Sunsilk presented the third day of the seventh PFDC Sunsilk Fashion Week. In keeping with the objective of furthering fashion retail and synergizing high end design, textile manufacturers and buyers, fashion week includes ramp shows by leading retail labels, high-street fashion brands as well as textile houses along with a fully functional, state of the art exhibition area. Day-3 featured the continuation of the afternoon High Street Fashion Shows with Generation, Roodaba Omar, Bareezé Man and Gul Ahmed and designer prét-a-porter shows by Fahad Hussayn, Republic by Omar Farooq, Body Focus Museum, MARIA.B., Nida Azwer and Karma Pink later in the evening. The success of PFDC Sunsilk Fashion Week continues to prompt private sector associates to grow in their engagement of the platform to launch new products, marketing campaigns and promotional activities. Day-3 of PSFW marked the return of Magnum to the platform for the second consecutive year with their popular custom made ice cream bar, Magnum Pleasure Spot. Title sponsors Sunsilk also extended their patronage as Red Carpet sponsors and hosted an exclusive Sunsilk ‘Guess the Bottle’ Lounge at PSFW. Official beverage partners Diet Pepsi hosted a media lounge and undertook complimentary sampling while Fed Ex – GSP Pakistan Gerry’s International, PFDC’s official logistics partner, also hosted a special media lounge at the event. Abbas Carpets and special handling and travel partner PIA also partnered with the PFDC for the first time at PSFW. All these activities will continue throughout the remaining days of PFDC Sunsilk Fashion Week. Further, Day-3 of PFDC Sunsilk Fashion Week 2014 was styled by the creative teams at Nabila’s and NGENTS. 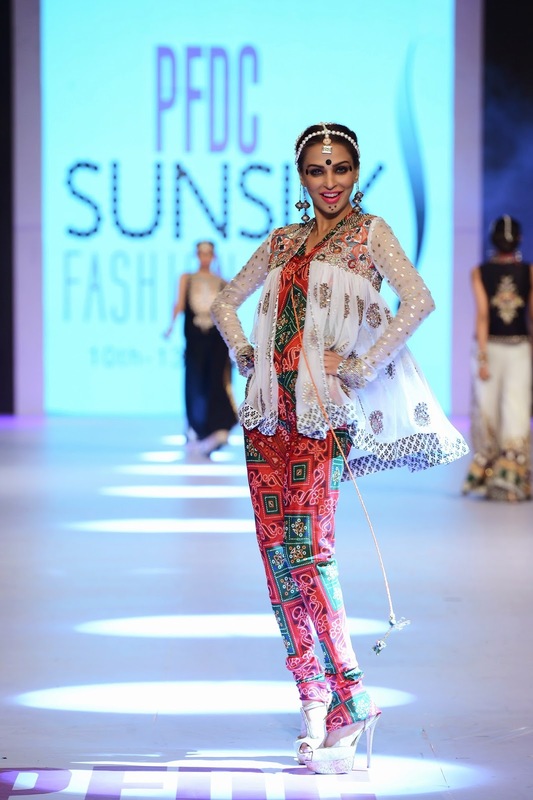 Generation opened the High Street Fashion segment on Day-3 of PFDC Sunsilk Fashion Week 2014 with their debut PSFW collection titled ‘Water on Ajrak’. Inspired by ajrak patterns, the women’s wear collection reinvented and accented the cultural aesthetic experimenting with sheer fabrics such as organza, nets, voile and crepe. With straight cuts, collars, v-necks, racer armholes and long slits, the label presented embellished jaal with ajrak motifs in machine and hand embroideries. Water on Ajrak’s colour palette featured a diversity of shades including white, ecru, spearmint green, cherry blossom pink, champagne beige and indigo. Key trends highlighted were sheer fabrics, layering, structured ensembles and tonal variations. Following Generation was designer Roodaba Omar who made her ramp debut at PFDC Sunsilk Fashion Week’s high-street segment with ‘Tehzib’. Inspired by the exquisitely mixed colors of Moroccan architecture, Islamic verses and beautiful buildings, Roodaba had based the collection in fabrics such as chiffon and silks, along with organza for its sheer feel. ‘Tehzib’ featured a diverse colour palette inspired by the rich progressive Moroccan culture, including green, blue, beige, white and red. The collection featured trendy sheer fabrics; known for their versatility, beauty, and the nature of the fabric, embellished with leather laser cuttings and other material. The concluding High Street Fashion show of the day was showcased by premier textile house Gul Ahmed who exhibited the brand’s ‘Ethnic meets Contemporary’ collection. The collection was inspired from traditional folklore wrapped in high street vogue. ‘Ethnic meets Contemporary’ was all about the fresh, happening and vibrant looks of summer, with a lot of play with fabric, layering and a fresh take on transparency. Based in a colour palette of vibrant hues, the brand’s showcase prominently featured cropped pants among other trendy separates. The collection featured dynamic prints with intricate embroidery coming together to create a fusion of the past with the present for sophisticated yet comfortable apparel. PFDC Sunsilk Fashion Week 2014’s Prèt Show on Day-3 was opened by designer Fahad Hussayn who showcased a collection titled ‘Kaala Pani’. The collection drew inspiration from the way of life lived and its influence on a person, which almost always results in one developing an alter ego or a split personality. Depicting life's true essence in Fahad Hussayn’s quintessential style; beauty, romanticism and glamor were interwoven with pain, catastrophe and suffocation in a unique runway collection. Majorly based in different shades of black, ‘Kaala Pani’ featured elements of leather and patent surfaces mixed with water gradation going into colors with Fahad’s signature clean, constructed silhouettes, draping and chain embroidery. Acclaimed model Zara Peerzada walked the ramp as the designer’s showstopper. Following Fahad Hussayn, menswear designer label Republic by Omar Farooq showcased a collection titled ‘Back to the Roots’. For this exclusive menswear collection, designer Omar Farooq had taken inspiration from the label’s debut PSFW collection and had incorporated prints featuring the botanical palm, camouflage and raw minerals which were manifested in the collection’s accessories. The collection was based in luxe fabrics including cotton, linen, tropical wool and other blends of wool in a dynamic colour palette featuring pastels, bold plaids, bold prints, houndstooth and windowpane. The collection featured tailored jackets and trousers with cuffed hems that were representative of the Great Gatsby with subtle variations that shifted from a vintage to a more modern aesthetic. The final designer showcase of Act 1 was by Body Focus Museum who presented their Spring/Summer 2014 collection titled ‘Sartorial Philology and Deconstruction’. For this collection, designer Iman Ahmed sought inspiration from the phrase “seeking perfection in imperfection” and had incorporated multicultural-influences while keeping the overall mood quintessentially contemporary. With a decayed colour palette, Body Focus Museum had used their signature pure natural silks and cottons for this collection, intricately hand printed, finely-cut and layered to render it casually chic. The first show of Act 2 was presented by acclaimed designer brand MARIA.B. who showcased a collection of luxury/pret wear titled ‘Ladakh Connection’ at PFDC Sunsilk Fashion Week 2014. Inspired by the designer’s search for her own identity and ancestral Kashmiri roots, the collection was based in a range of pure karandi, silk organzas, silk chiffons and digital prints, with a unique colour palette that drew equally from Kashmir’s natural beauty and aristocratic heritage as it did from its ravages of war. The collection reflected a modern take on the rich Kashmiri tribal culture with an emphasis on interpreting vintage Kashmiri craft and silhouettes into a modern, wearable collection. Following MARIA.B.’s presentation was acclaimed couturier Nida Azwer who showcased a new collection titled ‘The Urban Jungle Collection’. For this collection, the designer drew inspiration from the majestic Jungle where exotic animals and birds could be found along with indigenous forest flowers and foliage; interpreting these inspirations specifically within a contemporary context. In creating ‘The Urban Jungle Collection’, Nida Azwer Atelier had worked across fabrics such as cotton nets, silks, chiffons and organzas in a dynamic colour palette featuring white, greys, shades of pink and mint green. The collection featured digital embroidery, hand embroidery, embossing, cutwork and screen printing with ensembles in western cuts infused with classic silhouettes. Day-3’s finale was presented by designer label Karma Pink who presented their Spring/Summer 2014 collection titled ‘Karma ki Rajasthani Kahani’. The collection derived its inspiration from the soul, spirit and sensuality of the Rajasthan. With vibrant intense color juxtaposed with contemporary silhouettes capturing the essence of luxuriant Rajasthani style, the collection was based on Jewel chunri, signature screen print, old world gota, embroidered phulkari and glittery sequin embellished by mirrors forming lush roses, grand peacocks, wicked parrots and majestic howdah clad elephants. With this collection, Karma Pink celebrated a return to one’s roots with ethnic glamour and trademark collectable separates with an aim of encouraging women to embrace the desi drama queen in them.